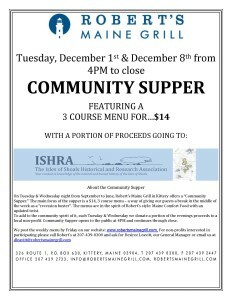 On Tuesday and Wednesday nights from September to June Robert’s Maine Grill, located on 326 Route 1, Kittery Maine offers a “Community Supper” starting at 4PM. The Community Supper is a $14 – 3 course menu in the spirit of Robert’s style: Maine Comfort Food with an updated twist. Robert’s regular dinner menu is also available. Robert’s will donate a portion of the evening’s proceeds to a designated local non-profit, which will be ISHRA on December 1st & 8th. Upcoming Community Supper menus are posted at www.robertsmainegrill.com. Reservations are recommended and can be made by calling 207-439-0300. This entry was posted in Events, News on July 31, 2015 by cbd232.